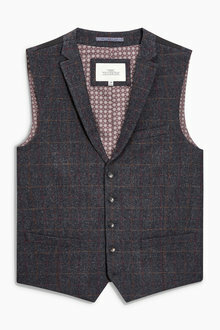 From tailored jackets to more casual, weekend appropriate coats, our outlet selection has it all at fantastic prices. It's your last chance to grab these men's styles, so shop the range today. A wardrobe essential in the cooler months, a men's jacket or coat will help you rug up warm while providing the finishing touch to your outfit. This outlet collection comes with reduced prices so you can find some quality jackets at great value. A cargo jacket is a practical addition to your wardrobe and pairs well with rugged jeans and hiking boots for weekend adventures. 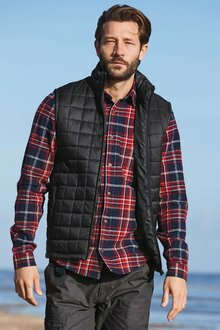 Or if you'd prefer a little more flexibility, opt for a puffer jacket to wear over your shirts. This sales collection also includes more formal styles for special events. We have discounted waistcoats and soft blazers that will work with both shirts and suit trousers or casual t-shirts and jeans. Please note, outlet purchases cannot be exchanged or returned unless faulty. Browse our discounted collection of men's jackets and coats on our outlet today and find a new winter essential at a great price.